What's more, 4Media iPhone Max for Mac is compatible with all iPhone/iPad/iPod models including iPad, iPad 2, iPad 3, iPad 4, iPad mini, iPad mini 2, iPad mini 3, iPad mini 4, iPad Air, iPad Air 2, iPad Pro (12.9/9.7/10.5 inch), iPod, nano (5th Gen), iPod mini, iPod shuffle, iPod classic, iPod touch, iPod touch 4, iPod touch 5, iPod touch 6, iPhone, iPhone 3G/3GS, iPhone 4, iPhone 5/5S/5C/SE, iPhone 6/6 Plus, iPhone 6S/6S Plus, iPhone 7/7 Plus, iPhone 8/8 Plus, iPhone X, iPhone XS, iPhone XS Max, iPhone XR. It helps you manage your iPhone playlists, music, photos and movies, add album artworks, and much more. Try it out for yourself FREE now! Using this Mac iPhone manager software, transfer apps, movies, audio, image files and pictures/videos shot by the device between your iPhone and your Mac without iTunes. You can even manage the document for some apps. Quickly and easily transfer iPhone movie and audio files to iTunes for backup. Now supports iTunes 12. You'll enjoy the album art in your music collection even more in 4Media iPad Max Platinum for Mac. Use Cover Flow to flip through your digital music. Grid View lets you browse all your music, movie, picture by their cover art. Or Search your collection by Album List View, Artist list view, Genres list view or Composers list view. 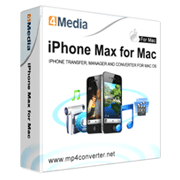 This Mac iPhone manager can convert popular video and audio format files to iPhone supported formats. Convert CDs/DVDs to iPhone videos or music; convert ISO images and DVD folders to iPhone supported formats. Support iPad, iPad 2, iPad 3, iPad 4, iPad mini, iPad mini 2, iPad mini 3, iPad mini 4, iPad Air, iPad Air 2, iPad Pro, iPod, nano (5th Gen), iPod mini, iPod shuffle, iPod classic, iPod touch, iPod touch 4, iPod touch 5, iPod touch 6, iPhone, iPhone 3G, iPhone 3GS, iPhone 4, CDMA iPhone 4, iPhone 5, iPhone 5S, iPhone 5C, iPhone 6, iPhone 6 Plus, iPhone 6S, iPhone 6S Plus; now also compatible with iTunes 12. Supports simultaneous iOS device connections. Create, edit, delete or rename playlists with ease; transfer iPhone ringtones and books in PDF or EPUB format to the device and manage with ease; drag and drop files to playlists. Organize iPhone pictures with customized photo albums; add one photo into multiple albums where iTunes cannot manage. Edit tag info of files including album, composer, year, title, artist and so on for easier iPhone file management. The Mac iPhone transfer automatically reads and displays iPhone info upon connection including model, capacity, version, format and serial number. 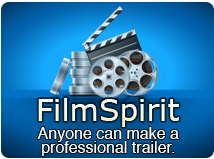 Movie, music and image files are sorted by artist, album and genre for easier file searching. This iPhone manager Mac software enables you to watch your iPhone movies and listen to your iPhone hits with the built-in media player. User-friendly interface available in multiple languages: English, German, French, Spanish, Italian, Simplified Chinese, Traditional Chinese and Japanese. Support iOS 4.2 and iPhone 4.